Epact: Astrolabe unsigned, circa 1600 ? 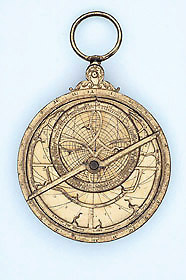 This instrument is unsigned and undated, but the design of the rete is very similar to an astrolabe in the British Museum signed by Humfrey Cole and dated 1574 (Epact 88308). On the rim of the limb is an inscription which characterises it as a donation of Nicholas Greaves, doctor of theology. Nicholas Greaves was the brother of John Greaves (1602-52), Savilian Professor of Astronomy in the University of Oxford.